An endless cycle of “check the ink” ensued, at which point I thought, OK, I can buy some more cartridges, rinse, repeat, or I can buy another printer. This is the problem with printers these days. Since all the money is made on the consumables, buying a new printer is anywhere from a rebated ‘free’, to a few hundred dollars. Even laser printers, which used to cost $10,000 when Apple came out with their first one back in the day, are a measly $300 for a color laser! So, I did some research. 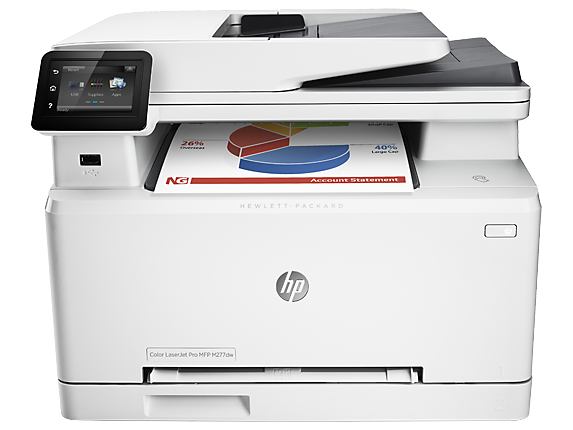 In the end I decided on the HP MFP M277dw. It’s a pretty little beast. It came with an installation CD, which is normal for such things. But, since my machine doesn’t have a CD/DVD/BFD player in it, I installed software from their website instead. It’s not often that I install hardware in my machine, so it’s a remarkable event. It’s kind of like those passwords you only have to use once a year. You’ll naturally try to follow the most expedient path. So, I download and install the HP installer appropriate for this device and my OS. No MD5 checksum available, so I just trust that the download from HP (at least over HTTPS) is good. But, these days, any compromise to that software is probably deep in the firmware of the printer already. The screens are typical, a list of actions that are going to occur by default. These include automatic update, customer feedback, and some other things that don’t sound that interesting to the core functioning of my printer. The choice to turn these options off are hidden behind a blue colored link at the bottom of the screen. Quite unobtrusive, and if I’m color blind, I won’t even notice it. It’s not a button, just some blue text. So, I click the text, which turns on some check boxes, which I can check to turn off various features. So, further with the installation, “Do I want HP Connect?” Well, I don’t know, I don’t know what that is. So, I leave that checked. Things rumble along, and a couple of test print pages are printed. One says: “Congratulations!” and proceeds to give me the details on how I can send email to my printer for printing from anywhere on the planet! Well, that’s not what I want, and I’m sure involves having the printer talk to service out in the internet looking for print requests, or worse, it’s installed a reverse proxy on my network, punching a vulnerability hole in the same. It just so happens a web page for printer configuration shows up as well, and I figure out how to turn that particular feature off. But what else did it do. Up pops a dialog window telling me it would like to authenticate my cartridges, giving me untold riches in the process. Just another attempt to get more information on my printer, my machines, and my usage. I just close that window, and away we go. I’m thinking, I’m a Microsoft employee. I’ve been around computers my entire life. I probably upgrade things more than the average user. I know hardware, identity, security, networking, and the like. I’m at least an “experienced” user. It baffles me to think of how a ‘less experienced’ user would deal with this whole situation. Most likely, they’d go with the defaults, just clicking “OK” when required to get the darned thing running. In so doing, they’d be giving away a lot more information than they think, and exposing their machine to a lot more outside vulnerabilities than they’d care to think about. There’s got to be a better way. Ideally, I think I’d have a ‘home’ computer, like ‘Jarvis’ for Tony Stark. This is a home AI that knows about me, my family, our habits and concerns. When I want to install a new piece of kit in the house, I should just be able to put that thing on the network, and Jarvis will take care of the rest, negotiating with the printer and manufacturer to get basic drivers installed where appropriate, and only sharing what personal information I want shared, based on knowing my habits and desires. This sort of digital assistant is needed even more by the elderly, who are awash in technology that’s rapidly escaping their grasp. Heck, forget the elderly, even average computer users who’s interaction with a ‘computer’ extends to their cell phones, tablets, and console gaming rigs, this stuff is just not getting any easier. So, more than just hope, this lesson in hardware installation reminds me that the future of computing doesn’t always lie in the shiny new stuff. Sometimes it’s just about making the mundane work in an easier, more secure fashion. What happens when PC cooling fails? So, a few months back, I finished the ultra-cool tower PC build. A strong motivator for building that system was to utilize a liquid cooling system, because I had never done so before. So, how has it gone these months later? Well, it started with some strange sound coming from the pump on the reservoir. It was making some clicking sound, and I couldn’t really understand why. Then I felt the tubing coming out of the top of the CPU, and it was feeling quite warm. Basically, the liquid cooling system was not cooling the system. But, I’m a tinkerer, so I figured I’d just take it apart and figure out what was going on. I took apart all the tubing, and took the CPU cooling block off the CPU as well. I opened up that block, and what did I see? A bunch of gunk clogging the very fine fins within the cooling block. It was this white chalky looking stuff, and it was totally preventing the water from flowing through. As it turns out, the Thermaltake system that I installed came with some Thermaltake liquid coolant, and that stuff turns out to be total crap. After reading some reviews, it seems like a common affliction that using this coolant: Thermaltake C1000 red will eventually leave a white residue clogging the very fine parts of your cooling loop, forcing you to flush and refill or worse. So, I started by dryingeverything off as best I could. I used alcohol and q-tips to dab up obvious stuff. The motherboard simply would not turn on again. There are a lot of things that could be wrong, but I thought I’d start with the motherboard. I ordered a new motherboard. This time around I got the Gigabyte GA-Z170X-Gaming 7. This is not the exact same motherboard as the original. It doesn’t have the option to change the bios without RAM being installed, and it doesn’t have as many power phases, but, for my needs, saving $120 was fine, since I lost the motivation to go all out in this replacement. The motherboard was same day delivery (which is why Amazon is great). It installed without a flaw. Turned it on and… glitchy internal video! Aagghh. OK, return this, and in another day get another of the same. This time… No problems. Liquid cooling system back together, killer video card installed, monitors hooked up, and it all works as flawlessy as before, if not better. This time around, I’m not installing any fancy cooling liquid. I’ve done my homework, and everyone who actually does these systems to run for the long run simply uses distilled water, and perhaps some biocide. I chose to get one of those sliver spirals to act as the biocide. That way there’s not chemicals to deal with. When the silver coil arrives, I’ll have to drain the pipes one more time to install it in the reservoir. I’ll also take the opportunity to use pipe cleaners on the tubes, which have become a bit milky looking due to the sediment from the C1000 cooling liquid. I now have a checklist for assembling the cooling system, to ensure I tighten all the right fittings, and hopefully avoid another spillage mishap. Thankfully the CPU, memory sticks, video card, power supply, and nvme memory were all spared spoilage from the flooding incident. That would have effectively been a new PC build (darn those CPUs are expensive). Lesson learned. There’s quite a difference between building a liquid cooling system for looks, vs building one that will actually function for years to come. I will now avoid Thermaltake like the plague, as I’ve found much better parts. Next machine I build will likely not use liquid cooling at all, because it won’t be as visible, so the aesthetic isn’t critical, and the benefits are fairly minimal. Enthusiasm is great, because it leads to doing new things. But, I have to temper my enthusiasm with more research and caution. I don’t mind paying more, piecing things together, rather than going for the all-in-one kit. This picture shows the machine after its last Frankenstein operation circa 2011. I purchased it as a kit in the first place so that I could ultimately create some simple objects like this: http://www.thingiverse.com/thing:11255 to connect drinking straws so that my daughter and I could construct objects like geodesic domes. Well, this machine never printed more than one or two objects in it wacky storied life until it was replaced with the original Up! machine, which just worked out of the box. Those were heady days in the 3D printing industry. RepRap, and the notion of printers printing parts for themselves was still an ideal, and the likes of Ultimaker, Zortrax, and even Prusa, were just glimmers in their creators eyes. The hotend for this thing (that mass of acrylic and steel sitting on the 5″x5″ platform in the middle there, probably weighed nearly a pound, consumed 3mm plastic, and just didn’t really work. All those nuts and bolts, tons of acrylic, funky resistors, an even a piece of delrin. It was all well intentioned, and all very experiemental, and it all just didn’t quite work for me. Compared to a new modern extruder/hotend combo, this might seem relatively stone age, but it did have all the basics that we take for granite today. I’m happy we built this machine. It was a great bonding experience, and it was then that my daughter and I cemented ourselves as ‘makers’. We went to a MakerFaire, played with electronics, sewed leds into a dress, and generally carried ourselves into the modern age of making. I have since purchased an original Up!, an early prusa mendel, original ultimaker. Then I jumped into another realm with a ZCorp 650, ZCorp 660, then back down to earth with an Afinia Up Box, and lately Type A Machines Hub, and Prusa i3 MK2. That’s a lot of plastic, powder, glue and frustration right there in all that madness. I purchased the first kit to make a little something for me and the daughter to play with. I’ve since explored the various ways in which these devices may or may not be utilized in the real of custom on-demand manufacturing. That journey continues. This cupcake was both fun and frustrating as all heck. I’m a bit nostalgic to see it go, but now that it’s real value is in the various M3 screws and nuts, I’m happy to have let this particular nightmare in our printing history go. RIP cupcake. You served us well. These bulbs were already cheap at the local Lowe’s Home Improvement store. But, for Christmas, they were $2.20 each! Well, I only needed 7 more to finish up the job I started, in terms of flood light replacement, so I got them. At this rate, they’re cheaper than incandescents, by a long shot, so why not? For my particular house, the vast majority of bulbs in common areas, are these floods, so replacing them all will make us feel good about the environment. In most cases, these bulbs are in sets of at least three or more, so there’s a question of the light switch that goes with them. In two cases, the family room and kitchen, there are mechanical dimmer switches. Those are older Lutron dimmers, which were good for the older floods, but not tuned to the all new LED floods just installed. They work, but in a kind of clunky way. When you dim really low, the lights might start to flicker, becoming unbearable to be under. So, some new dimmers are required. There’s a whole story on dimmers waiting to be written, but there are basically two ways to go. Either stick with another simple mechanical dimmer, with no automation capability, but at least LED savvy, or go with an automation capable dimmer. This is as much a cost concern as anything. I went with both depending. This is a typical mechanical dimmer. I chose Lutron models that are pretty much the same as the old ones, except they handle CFLs and LEDs much better. This is a good choice when you’re not going to do any automation in the area, you just want to slap that switch on or off when you enter and exit the room, simple and sweet. So, in my kitchen nook, which has 3 lights, I put this one in. I also put it in for the 9 lights in the kitchen, but after some thought, I decided I want to do some automation for the kitchen, so I need an automatable switch instead. In this case, it’s a dimmer that works with the Lutron Caseta automation system. There are myriad automation systems from all sorts of companies. I went with Lutron because that’s what was already in the house previously, and I’ve known the name for at least 40 years, and the reviews on them seem to be fairly decent, and they work with the Alexa thing. These are great because they work with the LEDs, they’re automatable, and you can still just use them locally by pushing the buttons for brighter, dimmer, on, off. So, that covers most of the lights. But what about all those others, like the bathrooms, bedrooms, entry way, porch, etc? Well, in most cases, you can just replace a typical 60 watt bulb with the equivalent 9-11w LED equivalent. Choosing a color temperature (2700 – 3000K probably the best). These can still work with standard light switches, so nothing more to be done. Probably not worth installing a $50 automated dimmer on each one of these lights, but you could if you wanted to. Now, there are some spots where you actually want to do a little something with color. In my house, perhaps on the balcony (3 lights), or a play room, or prayer nook. In these cases, you can install something like the Philips Hue. This is a bulb that is individually addressable. It requires yet another Hub device, this time from Philips. What you get though is the ability to set the color to a wide range of colors, as well as the general dimness. You can set scenes, and if you want to write a little code, you can even hook up a Raspberry Pi to change the color to match the natural daylight. At $50 a bulb, this is a very spendy option ranking up there with the choice between mechanical and automation ready dimmer switches. In this case, you get the automation without having to install an automation dimmer, but you pay the automation cost for every single light you buy. So, for my balcony, it would cost $150 for three lights, or I could go the standard LED and dimmer route for more like $60, assuming I already have the appropriate hub in either case. What you lose with the standard bulb/dimmer approach is the ability to change the color. For my balcony, I don’t need to change the color. So, these automated colored lights make more sense for something like a bathroom, or an office space, or somewhere else where you spend time and care about what the lighting color is doing. And there you have it. No matter what you choose, they MUST be LEDs. At least that’s the mantra of this day. then you are free to choose a mix of automated dimmers/switches, and automated color changing lights. In the future, for new homes, all the lighting will be LED at least, because it’s becoming the cheaper choice for builders. For higher end homes, I’d expect there to be hubs, with automated dimmers and colored lights as a standard set of choices the homeowner can choose, just like carpet, paint color, and cabinetry. Reminiscent of a Memorex commercial (for those who can remember that iconic commercial with the fellow sitting in his lounger and being blown away). My design goal was a workbench like thing whose sole purpose would be to act as a computer work table/cabinet thing. I don’t need a ton of drawers, I can simply stack plastic bins in there, or outside, if I feel I really need them. I wanted an ample keyboard/mouse surface, because sometimes I need to place another laptop on the surface, or write stuff, and it’s nice to have the room to just push the keyboard back and use the worktop as a worktop. I started out with a fairly standard looking garage workbench carcass. I put that power strip in there because it’s totally hidden when the workbench top is on, and it provides enough outlets, spaced far enough apart, that I can plug in the computer, 2 or three monitors, extra lights, speakers, and other stuff that might so happen to be sitting on the work top. The thing is roughly 36″ on a side, with the worktop being 36″x33″ if memory serves correctly. This is in my ‘home office’ room, so there is carpet. I had the dilemma of how to cart the thing around, because fully loaded, it’s quite heavy, and unwieldy. I had a package of those furniture moving pads in a drawer, so I whipped those out, and they work a treat! Each pad has a vinyl plate bottom, with a rubber top. The 2×4 lumber sits nicely in the rubber, and I can easily move this thing all over my office all by myself. With the demands of family, this took roughly two days to assemble. Now that it all works, I can think about actually finishing it. The things I want to do are to make it more like furniture, and less like something you’d find in the garage. That means, doing some sanding, mahogany staining, varnish, and the like. I’ll top the 3/4″ MDF top with an 1/8″ piece of hard board, and put some trim around the edge, to act as a buffer, and to hide the seam between the hardboard and MDF. This makes for a nice durable surface that I can tape paper to every once in a while if I so happen to do any gluing or other craft work. I’ve added the speaker system to the workbench, but right now it’s just kind of there, with the wires hanging all over. I’ll have to drill a couple of circular holes for wire pass through. To further make it kid proof, I’ll add some plexiglass siding, to keep their delicate little fingers out of the silently whirring fans. Putting the computer in the corner as it is, is a pretty good thing. It’s not taking up main floor space like the desk I was using. That gives me a ton of space to do other stuff, like setup a mini 3D printer farm. There’s a corner over by the window ready for exactly that. In a fit of inspiration, I also removed the couch and chairs, which more often than not were collection places for junk. Now I have an entirely open wall, ready for yet another workbench something or other. Oddly enough, the wall on that side of the room is totally bare, and would be a perfect place to receive a 150″ micro projected image, as a large book case is on the opposite wall. Perhaps that would be good for video conferencing in the large? At any rate, the killer PC is getting a custom built piece of furniture. I’m getting a new perspective on my home work space, and life is grand. The tower PC has found itself sidled up next to the desk in my office. It’s not actually the best placement of the beast as you can’t really admire the innards from that position. It’s really cool though because it’s fairly silent, causing a faint rumbling in the floor from the cooling reservoir. You don’t really notice it until you turn it off. As this thing is fairly quiet, even the occasional click click noise of the disk actual spinning rust disk drive becomes noticeable, and slightly annoying. So, I decided to make my first mod to this beast. I took out the Western digital 2TB drive, and put in a Samsung SSD 850 EVO 1TB. There are a couple reasons for this replacement. SSD drives are great for speed and silent, and low energy usage. All good things. They’re still a bit spendy though. The 2TB version would have been twice as much, and then some. So, 1TB is fine for now, as this machine is not intended to be a storage power house, just enough to handle local stuff fairly fast. It may not seem like much of a change, but how has it worked out? Well, when I had the spinning rust in there, I put all my repos on the D: drive, so downloading things from GitHub had a noticeable lag. So too, compiling stuff with Visual Studio felt a bit sluggish. My thinking was, why on earth would my laptop (all SSD all the time) be much faster at fairly simple compilation tasks, when this desktop beast is so much more powerful. We’ll, I’ve just done a totally subjective test of compilation after installing the SSD and putting my repos on it. Conclusion: The snappiness level now meets my expectations. I conclude that SSDs truly are a beneficial thing.